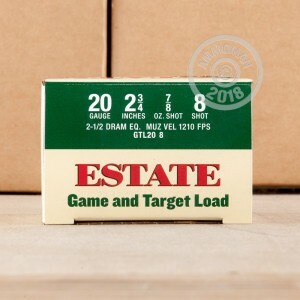 Estate Game and Target loads are an affordable choice to get you out on the range or out in the field. 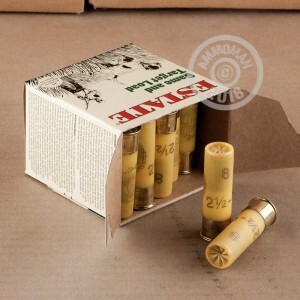 These 20 Gauge shells are 2-3/4" and have a 7/8 oz. payload of #8 lead shot making them a great choice for clays or upland game where lead shot is permitted. You can expect to see around 1,210 feet per second at the muzzle, so these loads are lighter on the shoulder than others. Estate cartridge is part of Vista Outdoor Inc. who owns several ammunition manufactures including Federal Premium Ammunition, CCI, Blazer Ammunition and others. 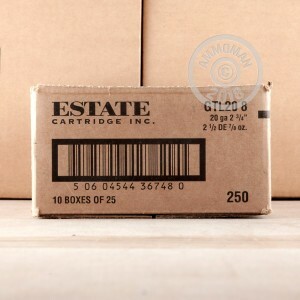 Estate is known for producing affordable shot shells suitable for the range and the field. Their shells are loaded in Anoka, Minnesota. Want free shipping? Place any order at AmmoMan.com over $99 and the shipping is on us!